Oh. My. Stars. I don't think I can ever fully describe to you how good these are! A friend of mine made these for a dessert contest and won, hands down. I had made a dessert to enter in the same contest, and after tasting these, my husband turned to me and said, "I hope you don't mind, but I'm voting for these." I replied that I was voting for them, too, because they were clearly the best dessert there. These brownies are perfectly chocolatey, with gooey caramel in the middle. The flavors all balance perfectly; there's not too much of any one thing to overpower the rest. 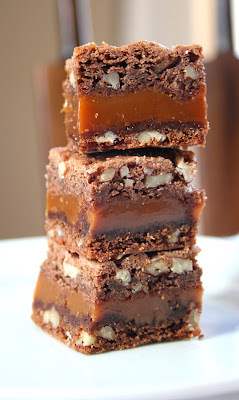 They are my new favorite brownie, and one of my favorite desserts. Final Rating: 5 out of 5 stars. I wish I could give them more; you have to try these! Searching for another great brownie recipe? 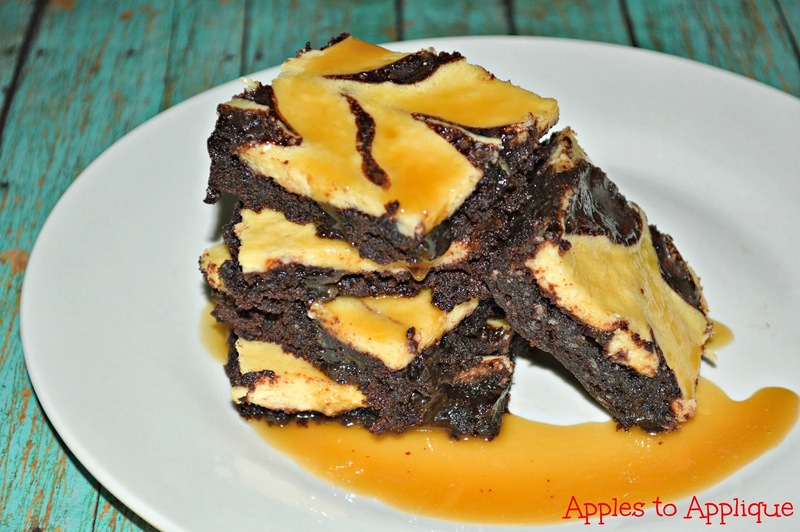 These Bailey's Cream Cheese Brownies with Bailey's Glaze are a fun treat for adults. Those look amazing! My kids would absolutely love them. I bet they would! They taste delicious. They look good, but I must try the Bailey's brownies. They sound wonderful, too. Thanks! They are pretty tasty. I bet they would, too; these brownies are fantastic! Now those look really good. Not good for you, but good to eat! Definitely not good for you, but delicious when you want to splurge! Say the word "brownie" and I'm there. :) These look amazing! Me too! Brownies are my friend! my kids would never let these sit around.. they look amazing.. I agree...I've never met a brownie I didn't like! I agree--nom nom nom is definitely an appropriate way to describe these! They would disappear in my house, too! Oh my goodness, those look amazing. The caramel and chocolate.. oh yes!!!! I can never resist caramel and chocolate! They do look amazing! These would disappear extremely quickly in my house! They would in my house, too--and my daughter's not even old enough to help herself; it would just be me and my husband eating them! GIMME!!! I'd totally eat these. right now. or breakfast. AND Lunch. Maybe even dinner too!! Me too! I have the worst sweet tooth, and these are soo good!